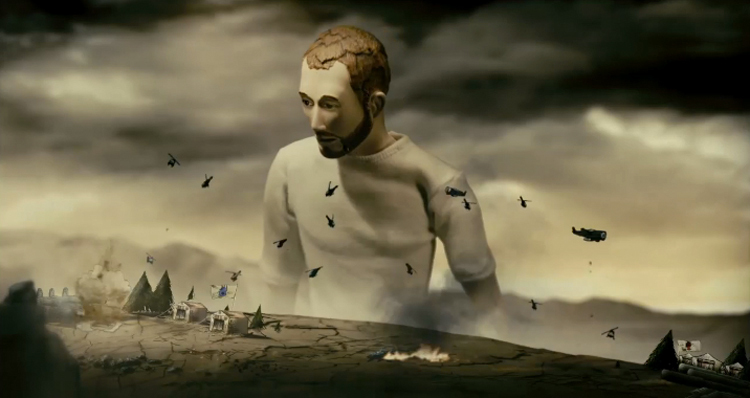 The Gloaming is an animated short of godly proportions from NoBrain trio – Saii, Charles and Niko. The story revolves around an unknown man in a barren land, who wakes to find himself with divine powers over a world he creates with his bare hands. Dialogue-free and employing a variety of animation techniques to create its striking visual style, The Gloaming is a production as ambitious and bold as the story it tells. With backgrounds in compositing, computer graphics and post-production, the NoBrain trio pride themselves on creating work that feeds off the three different personalities and areas of expertise and it’s an approach that pays dividends with their recent short. Godlike beings have been covered in film many times, but not many have brought the originality and impact of The Gloaming to the (big or small) screen – Bruce Almighty this certainly isn’t.